Mumbai Indians opening batsman Quinton de Kock Wednesday said his side will have a good chance to win against Royal Challengers Bangalore on Thursday if they get AB De Villiers out early. “AB being AB, he is a big wicket for them. I think if we get him out pretty early, we stand a good chance of doing well in the game. So we have spoken about it — about how we’re going to try and get him out and hopefully it comes off tomorrow,” de Kock told reporters on the eve of the match at Chinnaswamy stadium here. “Otherwise, we just hope he (de Villiers) makes a mistake,” he added. Considering his team’s loss to Delhi Capitals in Mumbai, de Kock said it will be a big game for MI against RCB and they need a win to get going. “Any big tournament around the world, everybody wants to get off to a good start. Coming into this game, knowing we haven’t won a game, so it’s a big game for us tomorrow. We need to get going with a win and hopefully build some momentum, get things rolling for our campaign this year,” he said. Mumbai Indians lost their first match against Delhi by 37 runs, despite Yuvraj Singh’s brilliant half century in his debut match for this franchise. “I have played against Umesh (Yadav), and a couple of their bowlers. When they are bowling well, they are really hard to get going against. 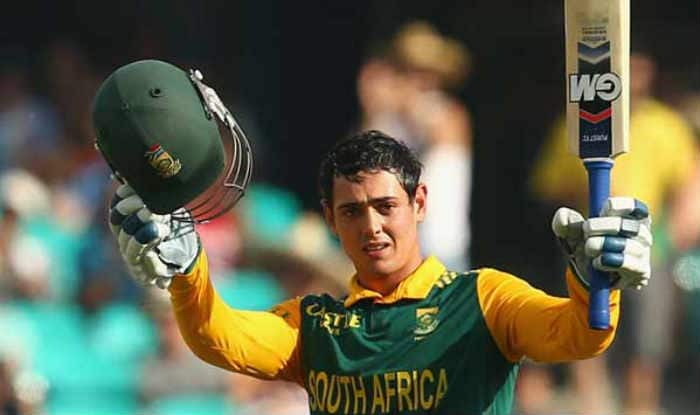 They have got some good bowlers in their team that they rely on so we are just going to go out there and see what happens and hopefully just come out on top,” de Kock said. He said he’s determined to score heavily in the tournament. “Playing in this tournament, no matter whom we are playing against or whom I’m playing against, you’re always quite determined to score runs whether that’s RCB, Delhi, Sunrisers whoever. I am always quite determined to contribute towards the team and just get the team over to a winning side. That’s what my goal is and what I wil try and do,” he said. “I have played with Rishabh before. I have seen him grow very quickly. He has a lot of power in his shots. He is a very strong boy. I think he is going to be a good investment for India,” he said.